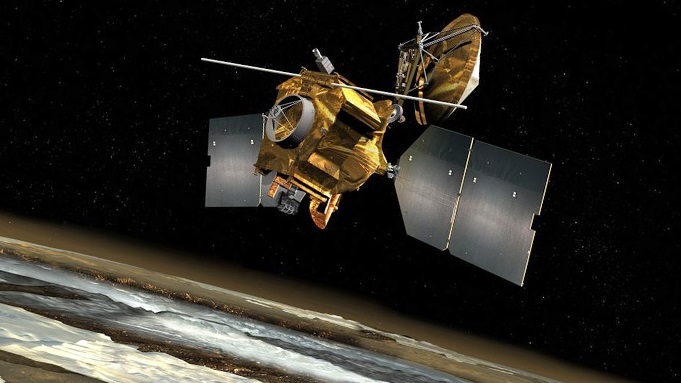 NASA’s Mars Reconnaissance Orbiter (MRO) has discovered Strong changes in the atmosphere of the Red Planet, such as the tilt of the planet’s axis changes. Scientists think that the changes can affect the stability of liquid water, if it exists on the Martian surface and increase the frequency and power of Martian dust storms.Using the Mars Reconnaissance Orbiter (MRO) scientists have found a large number of deposit of frozen carbon dioxide, or dry ice, at the Red Planet’s south pole. The scientists think that much of this carbon dioxide enters the planet’s atmosphere when Mars’ tilt increases. According scientists now carbon dioxide is nearly half frozen and half in the atmosphere, but at other times it can be nearly all frozen or nearly all in the atmosphere. But small increase of carbon dioxide will lead to more severe wind, more powerful and prolonged dust storms and higher temperatures, which conditions are more favorable to life. Although the global change the tilt of the Mars ‘ axis occurs only once in 100,000 years. What Represented the Universe at the Time of Its Birth? What are the Planned Objectives of NASA Exploration Campaign? What Was the Distance Between Mars and Earth During Longest Lunar Eclipse?